Gifts have been given and received in all eras and societies; gifts are part of a universal human exchange. The importance of creating and sustaining social bonds with the help of gifts is widely acknowledged by social scientists, not only from anthropological but also from economic, sociological, and political science perspectives. Contemporary anti-corruption campaigns, however, have led gifts to be viewed with ever-increasing suspicion, because it is feared that the social bonds created by gift giving may contaminate professional decision-making. Suspicious Gifts investigates the sensitive issue of gift exchanges and how they become an object of contention. Malin akerstro;m considers the moral dilemmas presented by bribes and gift giving as experienced by Swedish aid workers and professionals working in the public sector, business, and adoption agencies. She also deals with professionals' interaction with foreign officials or contractors. Often a gift is just that, although sometimes the gift giving may be seen by others as a bribe. akerstro;m highlights the tensions between strict regulations designed to prevent corruption with the human affection for the institution of gift giving. 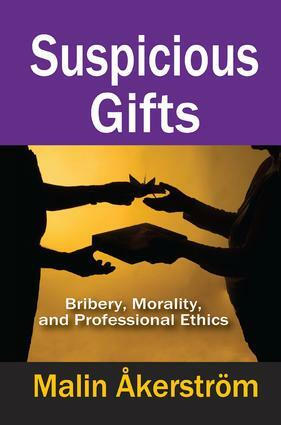 She argues that bribes and gifts are important social phenomena because they are windows into classic sociological and anthropological research issues concerning interaction, social control, exchange, and rituals. This unique analysis will be of keen interest to all sociologists, public officials, and professionals.